Caption : BANGALORE: 26/05/2010:Mr Koji Oda, MD, NEC India Pvt ltd (left) and Mr Kris Ranganath, CTO, (Government and Public Global Solution Division). 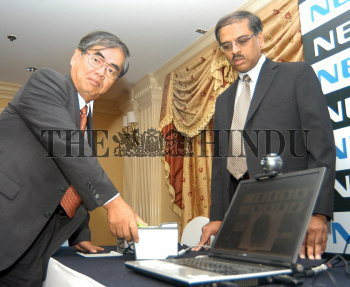 NEC Group at the launch of NEC Biometrics Excellence Centre at a press cofnerence in Bangalore on Wednesday. PHOTO: G R N SOMASHEKAR.